Yeah, your welcome! I'm glad you're interested! The cover for the Twisted Tale hardback is out. You can see at Amazon here. I don't think there's a paperback edition available for pre-order yet, since I couldn't find any picture for it elsewhere. I love the cover. The story idea is growing on me, with Ursula basically having dominion over two kingdoms. I might read this one. The Aladdin and Sleeping Beauty ones are supposedly atrocious, but the Beauty and the Beast got slightly more favorable reviews so perhaps Liz Braswell's quality is improving. At the very least her work still sounds better than Serena Valentino's series, which is saying something. I hope Braswell gets around to Snow White eventually, as well as Cinderella. Even if the books are awful, which I'm expecting, at least the covers will look nice. WOW!!! Like every movement, every pose!!! The logo for the film's 30th anniversary. It's both cute and beautiful. It's perfect. Does anyone know if this is official artwork? 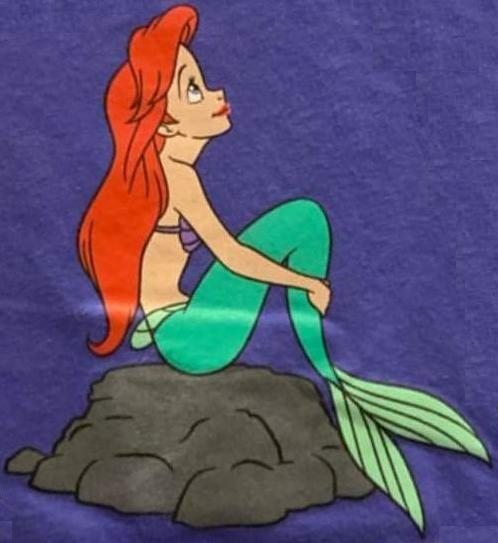 It's cleaned-up which indicates it was made for production but Eric's off-model, the collar of his shirt is different, Ariel's hairdo is also different and so is her seashell bra. Not to mention that this specific pose is not in the final film. On the other hand, the drawing is too well-made and old-looking to be fan art. Could this be from an earlier version where the designs weren't yet finalized? Was it made for something else like merchandise or publicity materials? I'm pretty sure that's official. Ariel has the same look there as she did in some concept art before her design was finalized. It seems similar to this. ^Thanks, I figured as much. Now, if only we knew who drew it. I wonder what the reason was behind changing the direction of the seashells? Maybe they were afraid that if they were point up they would be a little too...perky for a children's movie? In that picture, Eric looks quite a lot like Gaston minus the chin. Interesting that Eric once had long hair, going by the picture JeanGreyForever linked to. I'm not surprised they changed his design to a shorter haircut, but I wouldn't mind a male protagonist with long, black hair in a future Disney film. Yes, my guess is it was like a storyboard drawing. 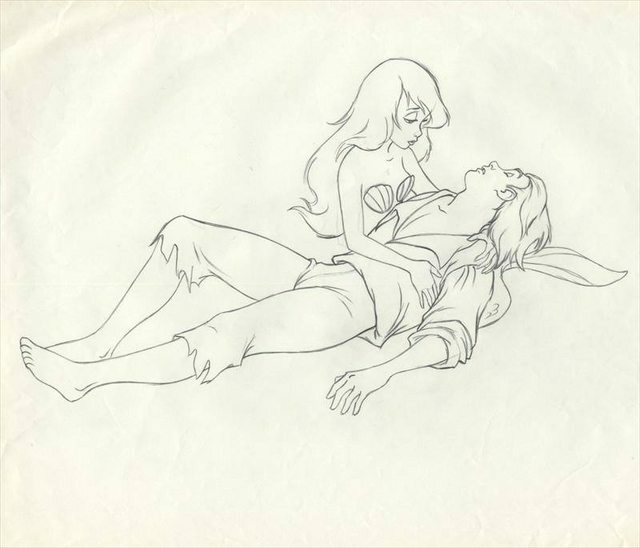 And I actually prefer Eric with long hair and Ariel with the shells that way. I feel like the shells were made more horizontal in the final film to make sense of the way the straps would hold them together. Lovely Anniversary logo; I wonder why it says '30 Years' rather than 30th Anniversary ? I think they couldn't fit the word "anniversary" in the limited space left for them, whereas the word "years" could more comfortably fit. That's not how graphic design works, lol. If something doesn't fit, you make it fit by adjusting other things. ^ You're assuming effort on Disney's part. While Disney in reality are like... "Nah." I actually prefer this older drawing of Ariel in the same pose. 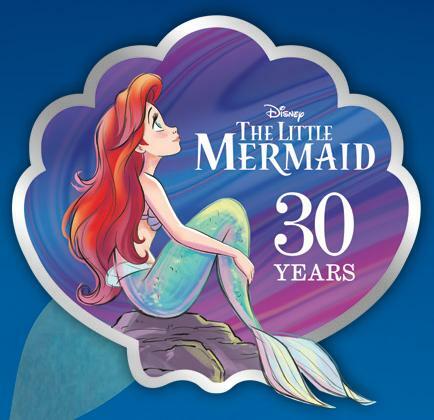 While it has less bells and whistles to it, Ariel looks more on-model than the one in the 30th anniversary logo. Really? Her head looks ridiculous there.